Over 30,000 copies of FIVE DAYS IN MAY have now been sold. 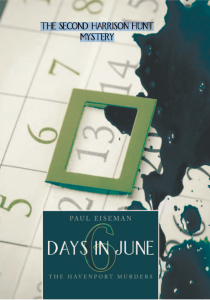 Over 20,000 copies of the newly published SIX DAYS IN JUNE have now been sold. SPECIAL UPDATE: SIX DAYS IN JUNE: THE HAVENPORT MURDERS , the second exciting Harrison Hunt mystery, is now available for ordering! Available in hardback, paperback and e-book formats . 2,000th copy of FIVE DAYS IN MAY: THE BROOKFIELD MURDERS sold. Book signing event in Beverly, Massachusetts. 3,000th copy of FIVE DAYS IN MAY: THE BROOKFIELD MURDERS sold. FIVE DAYS IN MAY: THE BROOKFIELD MURDERS is now available as an E-Book.KINDLE format is available from Amazon.com; NOOK format is available from Barnes and Noble.com. Family outdoor art treasure hunt walking tours of Manhattan developed by Paul Eiseman are now available for only 99 cents each as apps for iPhone, iPad, iPod. 4,000th copy of FIVE DAYS IN MAY: THE BROOKFIELD MURDERS sold. NEW MUSICAL co-written by Paul Eiseman and Adam Levowitz presented in a staged reading at Virginia theatre directed by Mr. Eiseman was a huge success. 5,000th copy of FIVE DAYS IN MAY: THE BROOKFIELD MURDERS sold. 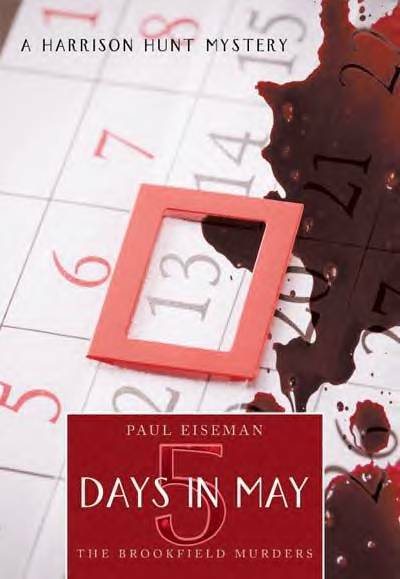 6,000th copy of FIVE DAYS IN MAY: THE BROOKFIELD MURDERS sold. 7,000th copy of FIVE DAYS IN MAY: THE BROOKFIELD MURDERS sold. 8,000th copy of FIVE DAYS IN MAY: THE BROOKFIELD MURDERS sold.